Your 5.5-hour city tour includes a comprehensive guided tour of downtown Los Angeles including iconic LA landmarks and 21st Century entertainment district, L.A. Live to The Museum of Contemporary Art (MOCA), The Broad museum, Walt Disney Concert Hall and Olvera Street, considered the birthplace of Los Angeles. Your small-group tour continues to Mulholland Drive, Hollywood & Highland Center and the Hollywood Walk of Fame. Following Hollywood, it's off to Sunset Blvd, celebrity homes, Beverly Hills (Rodeo Drive), Holmby Hills and Bel Air. Your tour ends with lunch (own expense) at the legendary Original Farmers Market and The Grove and a drive past Paramount Pictures on the way back to your original departure point in downtown Los Angeles. Choose from two departure times with pickups in and around downtown Los Angeles to begin your 5.5-hour tour. Your festivities begin with a guided comprehensive tour of downtown LA including iconic LA landmarks ranging from the original Theater District on Broadway and the 21st Century entertainment district called L.A. Live including the Microsoft Theater, the Staples Center and the Grammy Museum to The Museum of Contemporary Art (MOCA), The Broad museum, Walt Disney Concert Hall and Olvera Street. 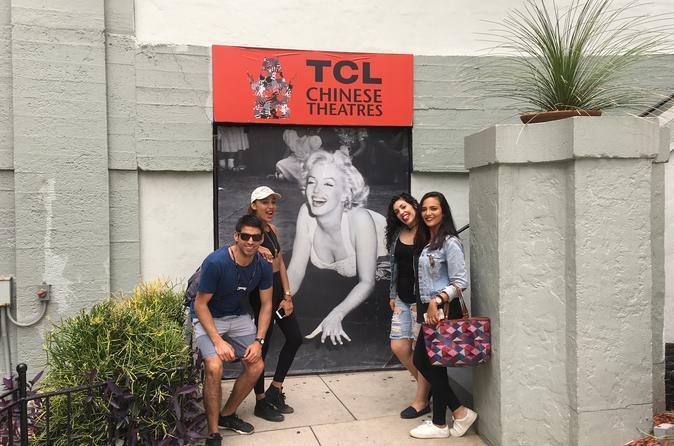 Additionally, your tour stops on Mulholland Drive for a photo-op at the Hollywood sign followed by a 45-minute break at the Hollywood & Highland Center where the historic Grauman's Chinese Theatre is located as well as the Dolby Theatre, and the Hollywood Walk of Fame. Following Hollywood, visitors are given a historic tour of Sunset Blvd and a tour of celebrity homes with a scenic drive through Beverly Hills, Holmby Hills and Bel Air. The tour wraps with lunch on your own at the hugely popular Original Farmers Market and The Grove. Visitors are then driven by Paramount Pictures on the way back to your original departure point in Los Angeles.